Lately I've been looking at a few big changes in life, mostly adjusting to life on the East Coast! This weekend I worked on a couple small watercolor pencil drawings made on the paper from France (Paris art store blog here!) Although my trip to Paris was in November, it took me a while to think about what I wanted to put on these delicately handmade pieces of paper. Perhaps I shouldn't say 'delicately handmade' - they're really strong and sturdy pieces of paper, yet you can feel the care and time that went into creating them. For these small watercolor pencil drawings I am still using the Caran d'Ache Supracolor pencils, wonderful pencils in every way. The variation of colors in the 80 pencil set prove to be a dynamic and sophisticated range. I couldn't decide on many of these pieces to add water to them or not. The seemed to look fulfilled with no water added, so I let them be for the most part. 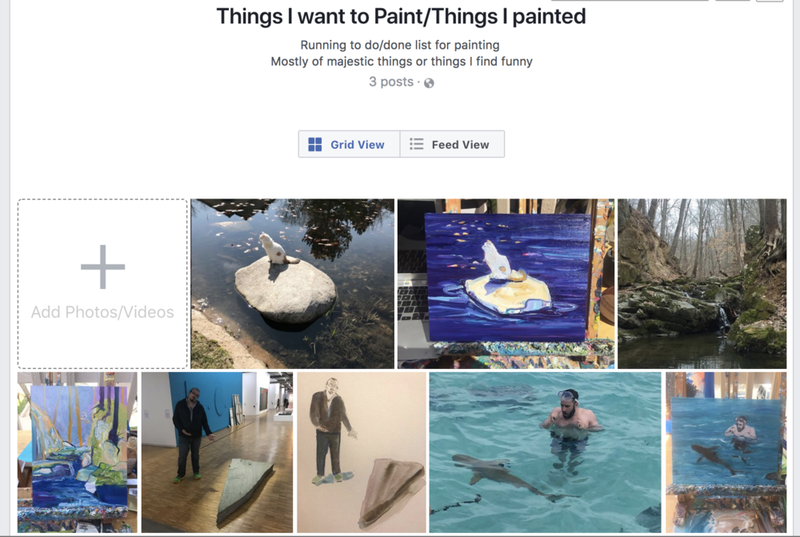 On the other side of the studio, I've been working through a list of Things I Want to Paint, a list of photos that I have assembled on Facebook of memories, things, and people that I want to paint. I decided to keep a running list of Things I Want to Paint after one day where I was stuck in front of my easel without a thought in my head of what I wanted to do. 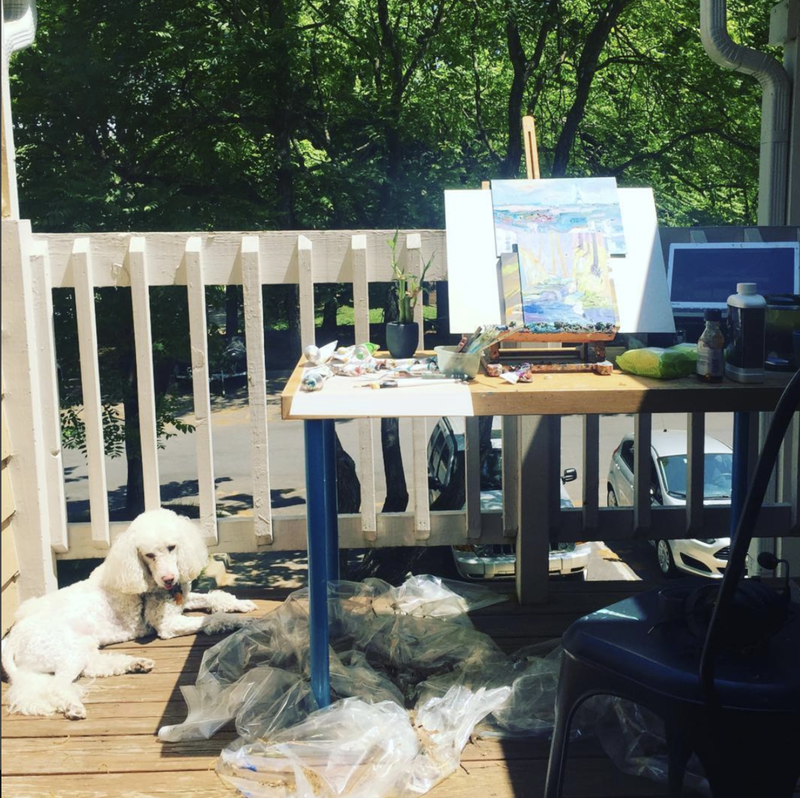 There is little worse than scraping along and finally getting time to paint and then suddenly... not knowing what you want to paint! Below are a couple results of "Things I Want to Paint"
These paintings are fairly in keeping with my style and outlook, I like to paint with bright colors only, I usually stay away from using brown or gray. This month has also been a good month for digital art. I am still loving every moment of Clip Studio Paint on the iPad Pro. I'm finished with the very generous free trial and am grateful for every feature, every penny is worth it. If I meet the developers of this app I will hug them. One aspect of Clip Studio Paint on the iPad Pro that stands out and that probably doesn't get enough laudation is the basic pencil tool. The pens are great. The watercolor effects are bangin. But the regular old pencil tool really... just drives it home. It seems so simple, but it's so very powerful. Most importantly, it feels natural. I haven't made as many romantic paintings or drawings this year, not sure what it means, I both struggle and resist in putting words to most of my best art - this is probably why. Lastly it's been a great couple weeks of Tilted Sun being released and out in the open. The comic launched on May 1 and releases a new page every Tuesday and Thursday. It's also featured on the top level navigation of this website. For some reason I always leave Tilted Sun for last, I'll have to not do that next time! Tilted Sun is free to read online! Tether Orbs, cyber horses, electric guards, spy birds, and all kinds of cool things await you in the world of Tilted Sun! Until next time ... excelsior!